It is a commonly held belief that using long tail keyword phrases in your AdWords campaigns is a good strategy for gaining a positive ROI. Long tail search terms tend to contain more detail and are more specific. This means they can potentially be more relevant to the product, service or information your company provides. Since long tail terms are more specific they also tend to have lower search volume and are therefore cheaper. The expected result would be a lower CPC and a lower CPA, if those longer terms are indeed hyper accurate to your services. The belief that long tail keywords in AdWords will lead to positive ROI does seem to make sense on the surface. When we really dig down to it, we know that businesses don’t really care about massive traffic for the sake of it. Everything in marketing is a means to an end, which is to drive conversions and by conversions we really mean sales. Businesses exist to make money and only care about brand awareness, impressions, clicks, and traffic if all these positive metrics are actually going to equal more profit. Bearing this in mind we could sensibly conclude that while high traffic and impressions are good, less impressions at a lower cost but with a decent percentage of conversions would be a good choice for a PPC campaign. 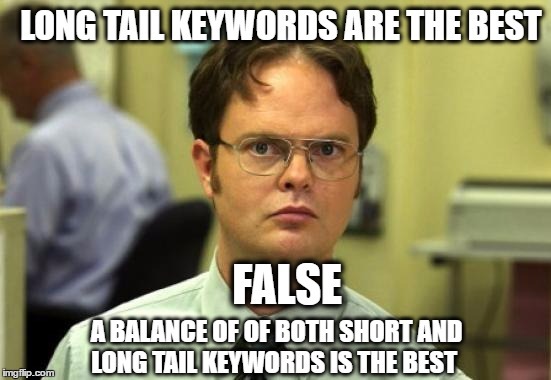 Unfortunately, most of the time this is not the case and advertisers often fall foul of misconceptions about long tail keywords in AdWords. These misunderstandings lead to frequent mistakes in the use of long tail terms, resulting in poor campaign performance. 1) Long tail is good therefore the longer the better. Quite a few misconceptions regarding long tail keywords stem from the fact that there is no set definition of what makes a long tail keyword. Is it 3 words, 4 words, 5 words or even longer to be classified as a long tail term? PPC influencers tend to disagree on the matter but we know that these so-called ‘long tail’ keywords are frequently praised for bringing customers to websites at lower cost. This has led to some less experienced advertisers thinking that the longer the term is, the more specific to their business it is and the lower the cost will be. This could not be further from the truth. Most people are pretty lazy when it comes to searching on Google. The majority of searches are quite short and succinct. The data speaks for itself: short tail keywords have more search volume and are more expensive because, unsurprisingly, more people search for them. It would be foolish to ignore the value of these short tail terms, especially if they are highly relevant to your company e.g. if you are an invoice finance company it would be a strange tactic to ignore those searching for invoice finance in favour of those searching for ‘help me gain quick access to unpaid client invoices’. So, why do some people search with long tail keywords at all? Sometimes long tail searches arise from users getting further down the conversion funnel in their research e.g. tall, rustic, mahogany armoire, but sometimes it is due to user frustration. They haven’t succeeded in finding what they are looking for with the short tail keyword and so keep getting more specific until a website shows up that has what they need. This is also one of the only times humans are willing to scroll past page one of Google. This makes long tail keywords an excellent resource for finding gaps in the market. If you find queries/long tail terms gaining a little search volume but few competitors providing a satisfactory answer, it is beneficial to target these terms in your SEO and content strategies to boost traffic. However, this does not always translate well into PPC. Digital marketers know that PPC, SEO, social marketing and content marketing are not completely distinct entities. Your marketing strategies should work together cohesively and these digital disciplines definitely have plenty of overlap. SEOs and content marketers often use data from PPC campaigns to influence their own campaigns, just as PPC specialists will use data gathered from organic channels to inform their strategies too. The problem starts when advertisers treat these different disciplines as interchangeable. What works for one will not always work for the other. Targeting fairly long tail keywords, such queries, in your organic search marketing can be extremely valuable but it is a longer-term strategy. If you depend too heavily on long tail keywords in your PPC it is going to take a long time to generate useful data and you’re going to fall short of your goals. Actually, this isn’t a misconception at all. AdWords is amazing and is the dominant PPC platform, which can deliver amazing results for your business but it is by no means perfect. AdWords’ functionality is improving all the time but it is still not capable of everything we want. This fact becomes abundantly clear when you discover that roughly 16 – 20% of daily Google searches have never been searched before. 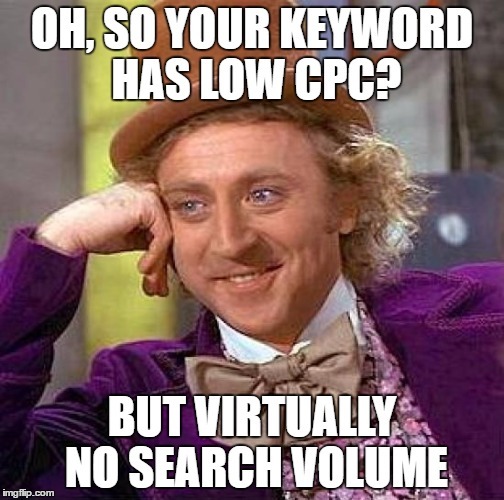 This means low volume keywords can have huge value for content marketing and SEO but sadly, as PPC professionals will know, if you try very low volume keywords in AdWords you aren’t going to tap into a new niche, you will be smacked down by the dreaded low search volume message. This is very frustrating for advertisers, especially those with a highly competitive or very niche business. In the most competitive industries like insurance, legal, finance and telecoms you could be facing very costly estimated CPCs, so saving a bit of money on long tail keywords would be ideal. If your business is niche and you know your market inside and out, you might feel certain that some very specific terms are relevant for your business and audience. You may have even looked into search query data in analytics and know a small pool of people are converting for a long tail phrase and yet AdWords won’t even let your ads show for these terms. So why does AdWords do this? While we would not agree with all the advice from AdWords, such as going broad match on all your terms, there are some fascinating truths from the video: “25 % of keyword searches on Google have never been seen by Google in the past 30 days”. It is especially disheartening for niche markets or small businesses with low budgets to know that, unless people are searching for their services all the time, they could be thwarted in their long tail keyword PPC efforts. The AdWords commentator is quite right that humans are very creative in the way they express themselves compared to algorithms. Hundreds of people could be looking for the same service or answer to a question, yet the way they search and how they express themselves may have a huge number of variations. This is why it is a challenge for AdWords and marketers when it comes to paid traffic. As Google’s algorithms get smarter they get better at understanding more conversational language and we can only hope that AdWords follows suit and places value on low volume terms to let advertisers experiment. The Rank Brain algorithm for Google’s organic search is a step in the right direction, with the ability to see search queries that have never been searched before in context to make a guess at which results are relevant. This is naturally the primary motivator for using long tail keywords in PPC. Not every long tail keyword gets caught by the ominous low volume label in AdWords and it’s easy to see why advertisers in highly competitive industries would want to adopt the long tail tactic. Even if your long tail keywords are not paused, they won’t necessarily save you money and give you a competitive edge. 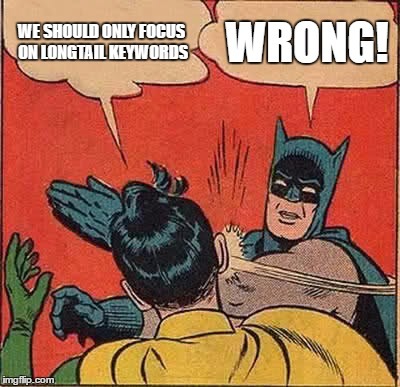 PPC Hero and Clicteq are just a couple of the industry giants who decided to test the theory of whether long tail keywords really do save money in your PPC campaigns. The results were unanimously disappointing. Both found that “90%+ of all impressions are generated by search terms that are 4 or less words long, so the long tail only represents 10% of all paid search traffic, not the 70%+ that most search marketers believe”. This must be taken with a pinch of salt as both sets of research count a 4-word keyword as short tail, whereas many advertisers would class 4 words as falling within the realms of long tail keywords. Still the results remain disappointing for any advertisers utilizing lots of terms longer than 4 words. Hand in hand with the belief that long tail keywords will definitely save you money is the dire mistake of only using long tail keywords in your PPC. This is probably the biggest mistake that comes from the misconceptions we have outlined. Relying solely on long tail keywords is where campaign performance is really likely to suffer. When you first build an AdWords campaign, you have no solid proof that your costly keywords are going to generate a return. This can be troubling for businesses in competitive industries viewing their CPC forecast, so it’s tempting to stick to long tail keywords. You may think you’re playing it safe but there is a real danger you will miss out on the majority of your clicks and conversions. You also won’t get far in generating enough data to target new terms or see which work best if you only target long tail terms with very low search volume. Have you been tempted by Google Analytics data showing a select handful of users converting for a long tail keyword? This could be an opportunity or you could still end up with a cluttered account full of underperforming terms and little profit to show for the time you invested in building the campaign. It may seem like you’re saving money at first but only because you’re getting so few clicks. The consequence is less traffic and potential conversion losses, so you could actually end up losing money on the campaign. There is also a persisting myth that you can bid more accurately with long tail keywords. This will not be true if you have made mistake number 5 and are relying on long tail terms alone. This is because to make decent bidding decisions you need a large amount of data. As E Consultancy cleverly point out, if all your keywords are long tail and only generating a tiny number of impressions per keyword per month, it is going to take a very long time to gather enough data to make an informed decision, even if the CTR was as high as 10% when an impression was generated. Does this mean advertisers should not use long tail terms in PPC? Relax, it’s not all doom and gloom and there is no reason to abandon long tail keywords altogether in PPC. You just need to be aware of the false myths and proceed with caution. There are situations where long tail keywords are a good idea for your PPC campaign. The most important lesson is to stop ignoring your own data. If your short tail keywords are very costly you may want to trial introducing some long tail keywords. There are lots of ways to find relevant long tail keywords with some search volume. Once you have added your long tail keywords watch your data closely. Head to the search terms section of AdWords to see which keywords users actually wrote to generate your ad. You may find that your intuition was close yet not right on the money. Your new long tail terms were enough to point in the right direction. If people are now searching slightly different long tail terms, add these to your campaign. If some of them are producing especially good conversions then bid higher on these terms. To access your search terms report, simply click the keyword tab in your AdWords dashboard. You will then see what users have actually searched to generate your ad. Make sure you add the conversions and conversion rate column to accurately gauge which long tail keywords might be worthwhile. Some industries don’t have many long tail terms with sufficient search volume, others have a few unique examples, while some do very well off long tail keywords. As you can see from PPC Hero’s diagram, one of their own campaigns saw some great results and reasonable CPC for 4 – 6 word terms. If your data does support long tail keywords having enough traction, you can better tailor your ad copy. To avoid putting off users attracted to your current ads you could launch a separate campaign for your best performing long tail keywords with unique ads. It is now even easier to write tailored ads for long tail keywords thanks to expanded text ads. Set your best performing long tail keywords as negative keywords in your original campaign, so that you can more easily compare data and avoid duplications. If your campaign was showing interesting results for long tail keywords, you might be tempted to jump on these opportunities heavily by building out all those long tail keywords and making lots of tailored ads. Remember your time spent investing in the campaign build is also valuable. PPC Hero make an interesting point in their in-depth case study, that despite good CPA for long tail keywords in the campaign, the low frequency of conversions compared to short tail keywords meant it was not worth fully building out all the long tail keywords for the campaign. A good guide is to only build out the best long tail keywords that generate good conversions and are hyper relevant to your company. Another issue that was found in the case study for long tail keywords was overlapping terms. With lower volume terms, you might have widened your match type away from exact or phrase, perhaps to broad match modifier to cast a slightly wider net. The problem is that your ads might then show for less relevant variations. You can solve this issue by keeping a close eye on your search terms report and adding any irrelevant terms as negative keywords. Balance short tail and long tail keywords. Always keep your core, high volume terms in a campaign and a few long tail examples if they perform well. Don’t keep looking for longer and longer terms. They are unlikely to have enough volume for AdWords to display your ad. PPC Hero, Clicteq and Wordstream corroborate each other on the opinion that there is little point exceeding terms longer than 3 – 5 words, unless you have strong data to back up the decision. Follow the data. Frequently check your search term reports for opportunities. Remember data is your friend. Be flexible. Many advertisers are now bidding on mid length terms which will increase competition and drive up cost. If you cannot find low cost, mid length terms and can only find great long tail terms that don’t have enough monthly search volume for AdWords, you could still use them in your content strategy. Try creating awareness around the term with content and search volume may even increase in response if you market it well. Don’t make match type too narrow. Don’t set all your terms to broad match but by having broad match modifier on long tail terms they might have more search volume. You could even do short broad match experiments on long tail keywords, just be sure to watch the search terms report and cost. If there isn’t enough search volume around a word consider widening your target location. More people may be searching for the term in other geographical locations. If a long tail keyword is not performing try reworking it slightly. Remember humans express themselves in many ways due to the flexibility of language. Don’t go too long tail if you are already in a niche industry, as you will be boxing yourself into a corner. Be patient. While you should not waste time on very low search volume terms, pausing them too soon can be hasty. As Google has said, if a term were to start receiving more volume they would un-pause it and allow your ads to show for the keyword. Everything is slower to accumulate with lower search volume keywords, so give these terms a little more time.